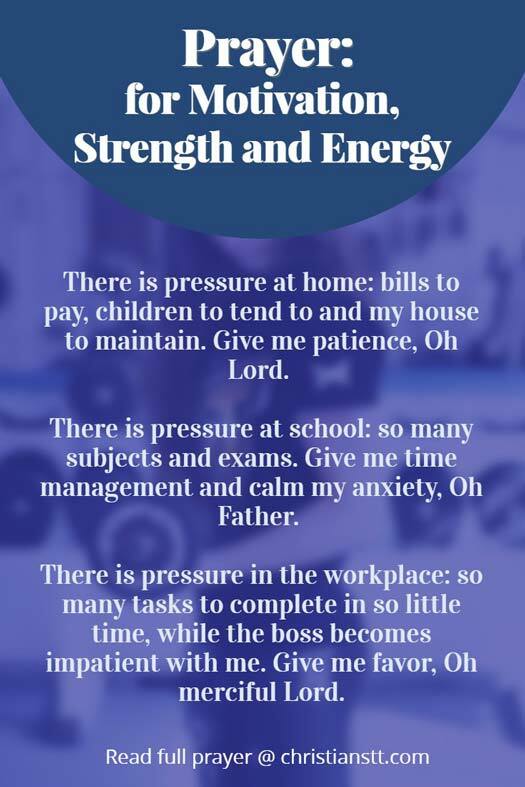 Struggling to cope with the pressures of life today? As we give our lives over to the lord and allow our faith to grow, the wonders of his love is revealed to us and within us. Today’s prayers seek motivation, energy and strength from God, our supplier. Omnipotent, Omnipresent Father, I am weary, weak, tired and drained. You are my strength, my motivation, my energy! Life is throwing its toughest battles at me at this very moment. But I will survive, for You are my strength when I am weak. You are my rock on which I stand firm on solid ground. Oh Gracious and Merciful Father, You raise me up to stand on the highest mountains and to walk on those stormy seas. Give me the strength enough for today that I will overcome. Empower me with all that I need to really push through today. Every stronghold is broken. I speak prosperity and positivity into my life, for life and death are in the power of the tongue. In Jesus mighty and powerful name I pray, Amen! Psalm 5:3 In the morning, LORD, you hear my voice. In the morning I lay my requests before you and wait expectantly. 2 Corinthians 12:9 And he said unto me, My grace is sufficient for you. For my strength is made perfect in weakness. Most gladly therefore will I rather glory in my infirmities, that the power of Christ may rest upon me. Oh Lord, my God, I am struggling today. There is pressure at home: bills to pay, children to tend to and my house to maintain. Give me patience, Oh Lord. There is pressure in the workplace: so many tasks to complete in so little time, while the boss becomes impatient with me. Give me favor, Oh merciful Lord. There is pressure at school: so many subjects and exams. Give me time management and calm my anxiety, Oh Father. I know that I can lay it all at your feet. Give me the strength and wisdom to release it all to you, in Jesus name I pray, Amen! Psalms 34:17 The righteous cry, and the LORD hears, and delivers them out of all their troubles. Heavenly and merciful Father, grant me today, the energy to complete all that lies ahead. Refresh my spirit, Oh loving King. Allow that spring of living waters to burst and flow out of me so that I can be the light in this dark, cruel world. Help my thoughts, deeds and actions to reflect You, each and everyday. Motivate me, Lord, as I draw close to You. Push me, shape me and mold me, as You continue to bless and reveal Your great plans for my life. In the precious, everlasting Name of Jesus I pray, Amen! Philippians 4:19 But my God shall supply all your needs according to his riches in glory by Christ Jesus.